A section 125 cafeteria plan lets a business owner offer affordable employee benefits while giving themselves a payroll tax break. Section 125 is officially an IRS pretax vehicle nicknamed “cafeteria plan” because employees can choose pretax benefits like medical or dental insurance or opt to receive the equivalent amount on their paycheck, paying taxes on it. If you’re looking for an easy way to offer tax-free benefit packages to your employees, check out ADP TotalSource. It’s a leading professional employer organization (PEO) that helps small businesses manage payroll, attract top talent, and boost retention with Fortune 500-caliber benefits in one easy-to-use platform. Get a free quote. A cafeteria plan is a pretax benefits plan that meets the specific requirements of section 125 of the Internal Revenue Code of the IRS. The main thing about a section 125 cafeteria plan is that employees receive a fixed amount of money allocated to them, regardless of whether they apply it toward health-related benefits ― on a pretax basis ― or receive it as part of their salary that may be applied to a taxable benefit like supplemental disability or life insurance. In a traditional insurance employer-provided insurance plan, the employer covers all or part of their employee’s premiums. If an employee decides they do not need health insurance — say, if they’re already covered by a spouse’s plan — they’re out of luck and don’t get the cash equivalent. With a section 125 cafeteria plan, in contrast, your employee can receive the allocated amount as cash, or use it toward another benefit that’s not part of the pretax plan ― commonly life insurance. Just bear in mind, if it’s used toward salary or any other benefit that’s not eligible for pretax status, the amount will be taxed at the employee’s usual salary rate. The IRS section 125 requirements include that the business offers money to the employees that can be used to purchase health insurance benefits on a pretax basis. The employee can take the money and buy the insurance they need, or they can keep the money as part of their paycheck. A section 125 plan has to include at least one taxable and one nontaxable offering. A cafeteria plan has to include at least one taxable benefit option to be compliant with section 125 of the tax code. The government views the taxable option as part of the employee’s salary. An example of a taxable option would be allowing employees to take the monthly amount as cash into their salary instead of using it toward the benefit plan. They could also use the money to purchase benefits that aren’t tax-free like a gym membership. The plan also must include at least one qualified benefit, which means it is excludable from an employee’s gross income under a specific provision of tax law, meaning it is pretax. To be compliant, your section 125 cafeteria plan must meet documentation and communication requirements. This is why we suggest working with a professional service like a PEO, insurance broker, or HR software, to make sure your cafeteria plan is IRS section 125 compliant. A section 125 plan document outlines specific details, such as a description of the employee benefits that are covered through the plan and what they cost. It also includes participation rules, annual limits, and election procedures like what constitutes a qualifying event, such as a spouse’s job loss or a move. The plan document is often provided directly by the benefits provider to the employee each year. A summary plan description (SPD) summarizes specific details of the plan in plain language and includes your company’s policies on eligibility and employer contribution. It also defines the plan year, claim filing procedures and information concerning plan sponsorship and administration. An SPD is best provided annually or whenever plan options change. In addition to distributing the SPD to your employees and their beneficiaries, you must also file it with the United States Department of Labor within 120 days of the plan’s effective date. For details, see these IRS guidelines. The laws are changing constantly. Federal legislation requires that section 125 plans can’t discriminate as to eligibility and benefits being provided, which is especially important if you have a wide range of compensation among your employees. For example, the plan can’t be biased toward your higher earners. There are also requirements to provide employee communication about plan options and to make documents available in the language your employees use. This is why we recommend working with a licensed benefits provider, be it a payroll provider like Gusto, a PEO like ADP Total Source, or an insurance company. 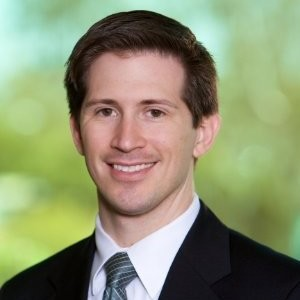 It’s critical to executing a cafeteria plan in compliance with federal and state tax laws as well as Health Insurance Portability and Accountability Act (HIPAA), Affordable Care Act (ACA) and Employee Retirement Income Security Act of 1974 (ERISA) regulations that affect employers of different sizes. Based on your state’s definition of small businesses, you may be able to take advantage of what’s called a simple cafeteria plan also referred to as a premium-only plan (POP). That’s not a self-funded plan like those offered by large employers who can set up and manage their own employee health care plans. Instead, it’s a plan offered in partnership with a fully insured vendor such as a health or dental insurance provider. POP is another kind of tax-free vehicle offered under IRS section 125 that has fewer compliance requirements than a traditional larger employer cafeteria plan. A cafeteria plan is a kind of fringe benefit. However, due to section 125 of the tax code, certain benefits qualify for pretax status. Here’s more on what fringe benefits are and how they work ― in layman’s terms to help you digest information from the IRS publication on fringe benefits. Here’s what you need to know about the three benefits that commonly make up a section 125 cafeteria plan. Note that you can implement just one of them, a combination of them, or all three of them for your cafeteria plan. POP plans allow employees to decide to set aside a portion of their pretax salary to pay for their health insurance premium contribution for most employer-sponsored health insurance plans like health maintenance organizations (HMOs), preferred provider organization (PPOs), and point of service (POS) plans through health insurance carriers. A POP plan is the simplest type of section 125 plan and is easy to roll out and maintain. HSAs fall under this category as well and can represent a kind of POP module. An HSA is pretty complicated to set up since it’s tied to a high-deductible health plan (HDHP); some employers, therefore, avoid having an HSA in their cafeteria plan. An FSA allows an employee to pay for certain medical expenses on a pretax basis. FSAs are a kind of savings plan allowed by the IRS. Effectively, the employee pays for out-of-pocket expenses that aren’t covered by insurance with dollars set aside in an account. If the FSA is the only benefit provided, it can also be used to reimburse employees for money they spend on health insurance premiums. However, an FSA can also be used for dependent care. The dependent care assistance program (DCAP) FSA is a benefit for employees who pay for child care or adult care for their parents. Single employees may hold back as much as $2,700 annually of their pretax salary for DCAP, including expenses they pay while they work, look for work or attend school full time. 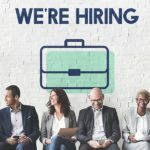 Qualified expenses may include the care of a child under the age of 13, daycare for parents, care for a disabled family member, and summer day camps. Let’s be clear: a section 125 plan is not always about providing health insurance. If you have fewer than 50 employees, you might want to consider these small employer health insurance questions before offering medical benefits to your employees. If this all sounds intimidating ― don’t panic. 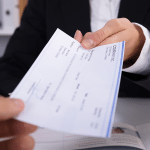 Many payroll services and PEOs can help you with the details. The benefits to an employer using a section 125 plan are great, albeit a bit complicated to understand. Some small businesses believe that the ACA replaced how employers offer pretax health insurance benefits, but that’s not true. Instead, they added more rules. In addition, depending on the size of your company and where you do business, there may be state-specific requirements affecting your cafeteria plans. The ACA requires that in addition to plan documents and the SPD, large employers ― those with 50 or more employees or full-time equivalents (FTEs) also provide a summary of benefits and coverage (SBC). That’s not the same as your plan docs. It’s more in-depth and is required to be provided in the language of your workers so they can make the correct health care choices. Employers with fewer than 50 staff members aren’t required to abide by the ACA. Further, the right to continue health benefits on an employers’ plan, referred to as COBRA, varies by state. Some states, like California, require COBRA for employers with as few as 20 employees. So just because you’re not under the jurisdiction of the ACA, you may still need to abide by COBRA rules. ERISA, not IRS section 125, is what requires you to provide an SPD to your employees and that’s not the same as the plan docs that the IRS requires for section 125 cafeteria plans. “Anytime you offer pretax health benefits for your employees, your business is subject to IRS section 125. People assume that buying group health insurance meets the requirements, but it’s not enough. You have to provide notices, set up a waiting period and provide plan docs. The good news is that the IRS doesn’t focus on the smallest of employers. Cafeteria plans can cost as little as a few dollars a month to thousands of dollars a year per employee, depending on how much you, the employee want to contribute. Money to set up and provide benefits through your cafeteria plan comes from two sources ― the business and the employees. The employer may or may not choose to contribute funds to each employee’s insurance premium. Insurance premiums vary based on the type of plan offered, whether coverage is for the single employee or for a family, and even what city and state your employees live and work in. Overall, health insurance premiums can range from a few hundred dollars a month to thousands of dollars a year. For more on the specific cost of different kinds of insurance read our Health Insurance Guide. The best providers for a cafeteria plan are PEOs, benefits insurance providers and HRIS software able to ensure IRS tax compliance as well as adhere to federal and state laws. Here are four vendors that can help you set up a section 125 cafeteria plan. ADP offers a PEO as a means of providing employee benefits and insurance. They essentially become a co-employer of your team providing payroll too. If you’re in the market for a PEO, ADP TotalSource is a trusted solution that lets you offer employees fortune 500-caliber benefits and manage critical HR tasks with fewer headaches. Pricing is customized and likely starts at more than $100 per month per worker. Get your free quote. Zenefits is a benefits insurance provider that provides HRIS software and a full range of section 125-compliant health insurance like medical coverage, HSAs and FSAs. It also offers HR support and can manage payroll if you prefer an all-in-one solution. HR and benefits start at $9 per month per employee, plus a $40 monthly service fee. Schedule a demo. 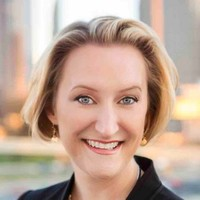 Justworks is a lower-cost PEO service that provides entry-level pricing for smaller firms that want to dip their toe into offering benefits to employees. Justworks’ PEO allows you to choose which features and pay for various tiers of service. It’s not as all-inclusive as ADP TotalSource, but it costs less too ― between $39 to $99 per employee each month. Visit Justworks. Gusto is a payroll provider that offers some HR features like employee onboarding. It also offers ACA-compliant health insurance in 24 U.S. states, but unlike some of the providers above, you may need to be more hands-on in terms of ensuring your business meets all the section 125 requirements for employers in your industry, size, and location. Gusto pricing starts at $6 per month per employee with a $39 monthly service charge. Try Gusto free for 30 days. To make a cafeteria plan a bit more understandable, we are going to focus this section on the benefits and drawbacks of cafeteria plans for both you and your employees. When you offer a cafeteria plan, your Federal Insurance Contributions Act (FICA), Federal Unemployment Tax Act (FUTA), State Unemployment Tax Act (SUTA), and workers’ compensation rates are all lowered since your employees’ income taxes are being lowered as well. Because you have reduced payroll taxes, your cost to set up the plan is offset. These taxes and compliance elements can be taken care of via payroll software if you feel able to manage the benefits offerings yourself. Due to the complex rules, overlapping government requirements and state compliance issues, it is best that you work with either an insurance company or a private insurance broker to help you set up your section 125 compliant benefits and communicate them to your employees. So, if Johnny and his wife fall upon hard times and want to stop their contributions to the cafeteria plan, they can’t do so until the one-year period is up. If you fail to explain that to them up front, they may take legal action against you. If you make an exception to help them out, you violate the requirements of section 125 and may be putting your business at risk in terms of discrimination, for example. That’s why PEOs like ADP TotalSource are such a good service option for small business employers that want to offer big-company benefits to their team. The PEO takes on all the compliance tasks, letting you reap the benefit of happier employees. Call for free quote. If a cafeteria plan and all its pretax rules sound confusing, consider other options that may be available to you. Many of these can serve the same function of helping you attract and retain great employees. Some smaller employers use cash bonuses and incentives to attract and retain employees when a cafeteria plan isn’t in the budget. For example, a business can offer workers cash bonuses for reaching sales goals, provide incentives for every year they stay on the job or make other additions to their salary to offset the health benefits employees don’t receive. Other employers use creative means, like employee perks, to keep their workers happy. It could be weekly pizza parties, ice cream socials, flex schedules or work from home options. These may cost less than offering tax-free health benefits, while still serving to attract and retain employees. In fact, some employees prefer perks over salary increases. Another way small business owners can motivate employees and attract talent without setting up a cafeteria plan is to create a provide sharing plan that gives workers a share of the business. Here’s how to set one up. Larger employers in the insurance or financial industry may be able to self-fund their own medical plan. This will always be subject to more rules and scrutiny that a smaller employer will find in a POP plan. Nonetheless, if you can afford to do it, a self-funded plan may be less expensive in the long run. Tax breaks and employee benefits can be confusing topics. Here are answers to common questions small business owners may have. If the question on your mind isn’t answered below, please post it to our forum. One of our experts will typically reply within one to two business days. What Is a Section 125 Cafeteria Plan Document? There are three kinds of documents typically provided with a section 125 pretax cafeteria plan. SBC, SPD, and section 125 cafeteria plan document. The plan document is a long-form description of what’s offered in the cafeteria plan. It includes costs, coverage and basic information. In many cases, the detail in the plan document can be pulled from the insurance vendors’ SBC document. Where Can I Find More About Section 125 of the IRS? Details on section 125 of the IRS are covered in a document referred to as publication 15b available on the IRS website. What Kinds of Benefits Are Not Allowed in a Section 125 Cafeteria Plan? Any kind of benefit is allowed. However, not all benefits are available as pretax benefits. In every case, fringe benefits are to be included as income to the employee, unless section 125 specifically excludes it and allows it to be provided to employees pretax. Examples of benefits that can’t be offered pretax are employee discounts, moving expenses, retirement planning, commuter benefits, education assistance, and tuition reimbursement. The IRS clarifies that any fringe benefit you provide to employees is subject to employment taxes and must be reported on the employees W-2. However, if you provide fringe benefits to those not on your payroll, you may need to use a different tax reporting method ― namely a 1099.
Who Is Considered an Employee for the Purposes of a Cafeteria Plan? Rules for who is considered an employee go beyond what you might commonly think and can vary based on the benefit offered. For example, a full-time insurance agent, a leased employee who has worked for you for a year, or even the widow of an employee or a retiree may be considered an “employee” depending on what kind of benefits are provided within your plan. Can S-Corp Shareholders Participate in a Cafeteria Plan? For cafeteria plans, any shareholder who owns more than 2% of stock cannot be treated as an employee. That means they may be able to participate in benefits as a business partner but will not be able to purchase those benefits on a pretax basis. 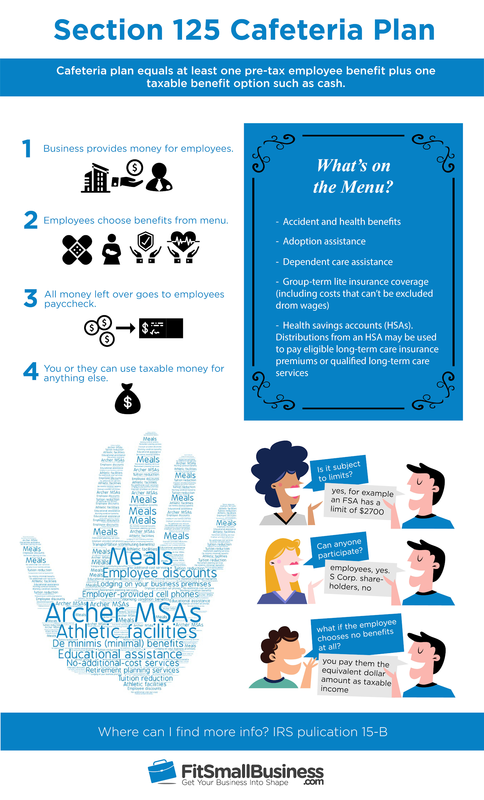 How Is a Cafeteria Plan Different From a Qualified Small Employer Health Reimbursement Account? Both a cafeteria plan and a qualified small employer health reimbursement account (QSEHRA) are kinds of employer-sponsored health care that can be provided on a pretax basis. A QSEHRA is used to provide a savings account that businesses with 50 employees and fewer can give to their employees to purchase health benefits whereas a cafeteria plan may provide health insurance as part of the plan. Employers with more than 50 employees must provide health insurance. An HRA alone is not sufficient. What Are Common Mistakes to Avoid When Setting Up a Cafeteria Plan? A section 125 cafeteria plan can be a great way for a small business owner to provide benefits while saving tax dollars and keeping their employees happy. However, we recommend that you work with a professional service to do this correctly and to reap the benefits while staying compliant. Don’t forget to check out ADP TotalSource, a PEO that helps you attract top talent, manage payroll and compliance issues, and offer helpful benefits to your employees, whether you choose to set up a cafeteria plan or not. Get a free quote. We are an S-Corp in Kansas. Can the bank president (over 2% shareholder) enroll in our medical (Humana), dental (Principal), and vision (Principal) plans if the deductions are Post-tax? Best of luck to you and your bank prez. i quite dont understand the cafeteria plan. I’ve been paying into it for many years At work. We no longer have benefits. Does the two have anything to do with each other? Each employer’s plan is different. Yes, a cafeteria plan is a way that employers offer benefits. They’re related. If you are paying into a plan, you should certainly know what you’re paying into, and what benefits you should be receiving. There should be a summary plan description provided by your employer, as well as a benefits administrator who oversees the plan details and can answer your questions. You will need to talk to the HR or benefits department to find out who the benefits plan administrator is, and to obtain information about your cafeteria plan. If you don’t have an HR person, ask your manager or business owner to provide the summary plan document, or to give you the name of the benefits administrator who can answer your questions. HI, can an employer switch their supplemental insurance carrier mid-year on a section 125 plan if they are wanting to save their employees’ money and/or give them a chance to have better coverage? You may want to talk to a tax attorney to confirm. Is there a minimum number of participants for Section 125? Can officers of an S corp participate? Can a company have 2 separate Premium Only Plan documents in place with separate plan year criteria? One plan would be for the medical/health coverage and the other for voluntary supplemental coverage? I can’t find anything to suggest you wouldn’t be able to do that. However, we are not writing as legal professionals, so I suggest asking a licensed health broker or insurance professional before moving forward.